Al Jazeera (Arabic : الجزيرة‎, translit. al-jazīrah, IPA: [æl (d)ʒæˈziːrɑ] , literally "The Island", though referring to the Arabian Peninsula in context  ), also known as JSC (Jazeera Satellite Channel), is a state-funded broadcaster in Doha, Qatar, owned by the Al Jazeera Media Network. Initially launched as an Arabic news and current-affairs satellite TV channel, Al Jazeera has since expanded into a network with several outlets, including the Internet and specialty television channels in multiple languages. The political system of Qatar is either an absolute monarchy or a constitutional monarchy, with the Emir of Qatar as head of state and head of government. Under the 2003 constitutional referendum it should be a constitutional monarchy. 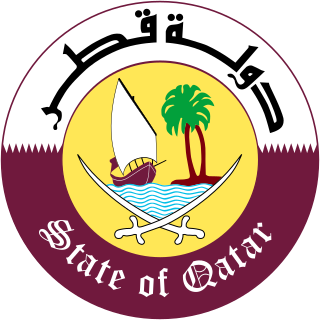 Sharia Law is the main source of Qatari legislation according to Qatar's Constitution. The Society of the Muslim Brothers, better known as the Muslim Brotherhood, is a transnational Sunni Islamist organization founded in Egypt by Islamic scholar and schoolteacher Hassan al-Banna in 1928. The organization gained supporters throughout the Arab world and influenced other Islamist groups such as Hamas with its "model of political activism combined with Islamic charity work", and in 2012 sponsored the elected political party in Egypt after the January Revolution in 2011. However, it faced periodic government crackdowns for alleged terrorist activities, and as of 2015 is considered a terrorist organization by the governments of Bahrain, Egypt, Russia, Syria, Saudi Arabia and the United Arab Emirates. 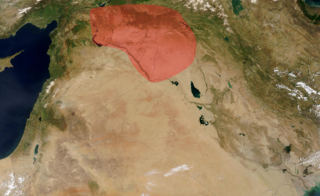 Upper Mesopotamia is the name used for the uplands and great outwash plain of northwestern Iraq, northeastern Syria and southeastern Turkey, in the northern Middle East. After the early Muslim conquests of the mid-7th century, the region has been known by the traditional Arabic name of al-Jazira and the Syriac (Aramaic) variant Gāzartā or Gozarto (ܓܙܪܬܐ). The Euphrates and Tigris rivers transform Mesopotamia into almost an island, as they are joined together at the Shatt al-Arab in the Basra Governorate of Iraq, and their sources in eastern Turkey are in close proximity. Orbit Communications Company was a privately owned Pay TV network, operating in the Middle East, North Africa and Asia. Owned by Saudi Arabia-based Mawarid Holding, it was the first fully digital, multi-channel, multi-lingual, pay television service in the Middle East and North Africa and was also the world's first fully digital TV network. Orbit broadcast in several languages around the world including English, Arabic and Filipino. Sheikh —also transliterated Sheik, Shykh, Shayk, Shaykh, Cheikh, Shekh, and Shaikh—is an honorific title in the Arabic language. It commonly designates the ruler of a tribe, who inherited the title from his father. "Sheikh" is given to a royal male at birth and the related title "Sheikha" is given to a royal female at birth. The Qatari riyal is the currency of the State of Qatar. It is divided into 100 dirhams and is abbreviated as either QR (English) or ر.ق (Arabic). In presenting "The opinion and the other opinion" (the station's motto), it did not take long for Al Jazeera to shock local viewers by presenting Israelis speaking Hebrew on Arab television for the first time. [ citation needed ] Lively and far-ranging talk shows, particularly a popular, confrontational one called The Opposite Direction, were a constant source of controversy regarding issues of morality and religion. This prompted a torrent of criticism from the conservative voices among the region's press. It also led to official complaints and censures from neighboring governments. Some jammed Al Jazeera's terrestrial broadcast or expelled its correspondents. In 1999, the Algerian government reportedly cut power to several major cities in order to censor one broadcast. There were also commercial repercussions: Saudi Arabia reportedly pressured advertisers to avoid the channel, to great effect. 1 January 1999 was Al Jazeera's first day of 24-hour broadcasting. Employment had more than tripled in one year to 500 employees, and the agency had bureaux at a dozen sites as far as EU and Russia. Its annual budget was estimated at about $25 million at the time. The Kabul office was destroyed by United States bombs in 2001. Looking to stay ahead of possible future conflicts, Al Jazeera then opened bureaux in other troubled spots. Qatari Minister of Foreign Affairs, Mohammed bin Abdulrahman bin Jassim Al Thani, has said Doha will not discuss the status of Al Jazeera in any negotiations. "Doha rejects discussing any matter related to Al Jazeera channel as it considers it an internal affair," Qatar News Agency quoted the foreign minister as saying. "Decisions concerning the Qatari internal affairs are Qatari sovereignty - and no one has to interfere with them." Al Jazeera restructured its operations to form a network that contains all their different channels. Wadah Khanfar, the then managing director of the Arabic Channel, was appointed as the director general of Al Jazeera Media Network. He also acted as the managing director of the original Arabic Channel. 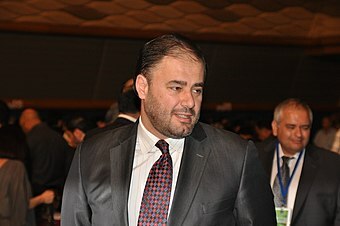 Khanfar resigned on 20 September 2011 proclaiming that he had achieved his original goals, and that 8 years was enough time for any leader of an organization, in an interview aired on Al Jazeera English. Ahmed bin Jassim Al Thani replaced Khanfar and served as the director general of the channel from September 2011 to June 2013 when he was appointed minister of economy and trade. The chairman of the channel is Hamad bin Thamer Al Thani. The Director General and editor-in-chief of the Arabic website is Mostefa Souag, who replaced Ahmed Sheikh as editor-in-chief. It has more than 100 editorial staff. The managing director of Al Jazeera English is Al Anstey. Mohamed Nanabhay became editor-in-chief of the English-language site in 2009. Previous editors include Beat Witschi and Russell Merryman. In 2003 Al Jazeera hired its first English-language journalists, among whom was Afshin Rattansi,  from the BBC's Today Programme. On 4 July 2005 Al Jazeera officially announced plans to launch a new English-language satellite service to be called Al Jazeera International. The new channel started at 12h GMT on 15 November 2006 under the name Al Jazeera English and has broadcast centers in Doha (next to the original Al Jazeera headquarters and broadcast center), London, Kuala Lumpur and Washington D.C. The channel is a 24-hour, 7-days-a-week news channel, with 12 hours broadcast from Doha, and four hours each from London, Kuala Lumpur, and Washington D.C.
Al Jazeera launched an English language channel, originally called Al Jazeera International, in 2006. Among its staff were journalists hired from ABC's Nightline and other top news outfits. Josh Rushing,  a former media handler for CENTCOM during the Iraq war, agreed to provide commentary; David Frost was also on board. In an interesting technical feat, the broadcast of the new operation was handed off between bases in Doha, London, Washington, D.C., and Kuala Lumpur on a daily cycle. Though Current TV had large distribution throughout the United States on cable and satellite television, it averaged only 28,000 viewers at any time. The acquisition of Current TV by Al Jazeera allowed Time Warner Cable to drop the network due to its low ratings, but they released a statement saying that they would consider carrying the channel after they evaluated whether it made sense for their customers. Time Warner Cable later began carrying Al Jazeera America in December 2013.
beIN SPORTS currently operates three channels in France – beIN Sport 1, beIN Sport 2 and beIN Sport MAX – and launched two channels in the United States (English and Spanish) in August 2012. The network also has a Canadian Channel and holds Canadian broadcast rights to several sports properties, The network also has an Australian channel. United States. Al Jazeera English is mainly available online via its live stream on its website, DVB-S, Galaxy 19 and Galaxy 23 C-band satellites. Following the launch of Al Jazeera America in 2013 until 2016 when the channel folded, Al Jazeera English was not available in the United States. It had been available through live streaming over the Al Jazeera website, DVB-S, Galaxy 19, free to air and Galaxy 23 satellites, and it had been broadcast over the air in the Washington, DC DMA by WNVC on digital channel 30-5, and on digital channel 48.2 in the New York metro area, but those broadcasts were discontinued on 20 August 2013. Al Jazeera English had also been available to cable TV viewers in Toledo, Ohio, Burlington, Vermont, New York City (WRNN rebroadcast), Washington State, and Washington, D.C (a rebroadcast of WNVC's feed), but those sources were switched to Al Jazeera America on 20 August 2013. Many analysts had considered the limited availability of Al Jazeera English in the United States to be effectively a "blackout". The live stream and programming over the internet that had been geoblocked was made available to viewers in the United States again in September, 2016. Online. Al Jazeera English can be viewed over the Internet from their official website. The low-resolution version is available free of charge to users of computers and video streaming boxes,  and the high-resolution version is available under subscription fees through partner sites. Al Jazeera's English division has also partnered with Livestation for Internet-based broadcasting. This enables Al Jazeera English and Al Jazeera live to be watched worldwide. Al Jazeera Media Network's web-based service is accessible subscription-free throughout the world, at a variety of websites. The station launched an English-language edition of its online content in March 2003. This English language website was relaunched on 15 November 2006, along with the launch of Al Jazeera English. The English and Arabic sections are editorially distinct, with their own selection of news and comment. Al Jazeera and Al Jazeera English are streamed live on the official site,   as well as on YouTube. On 13 April 2009 Al Jazeera launched versions of its English and Arabic sites suitable for mobile devices. The channel also has plans to launch a Spanish-language news network to cater mainly to Spain and Hispanic America, like the Iranian cable TV network HispanTV. Al Jazeera has also been reported to be planning to launch an international newspaper. Al Jazeera Arabic began using a chroma key studio on 13 September 2009. Similar to Sky News, Al Jazeera broadcast from that studio while the channel's main newsroom was given a new look. The channel relaunched, with new graphics and music along with a new studio, on 1 November 2009, the 13th birthday of the channel. During the 2011 Egyptian protests, on 30 January the Egyptian government ordered the TV channel to close its offices. The next day Egyptian security forces arrested six Al Jazeera journalists for several hours and seized their camera equipment. There were also reports of disruption in Al Jazeera Mubasher's Broadcast to Egypt. The channel was also criticized for being sympathetic to Mohamed Morsi and the Muslim Brotherhood and former IAEA director Mohammed ElBaradei. It was closed for the same reasons in September 2013. Twenty-two members of staff of Al Jazeera's Egyptian bureau announced their resignation on 8 July 2013, citing biased coverage of the ongoing Egyptian power redistribution in favour of the Muslim Brotherhood. Al Jazeera says that the resignations were due to pressure from the Egyptian military. Immediately after its launch in 2003, the English site was attacked by one or several hackers, who launched denial-of-service attacks, and another hacker who redirected visitors to a site featuring an American flag. Both events were widely reported as Al Jazeera's website having been attacked by "hackers". In November 2003, John William Racine II, also known as 'John Buffo', was sentenced to 1,000 hours of community service and a $1,500 U.S. fine for the online disruption. Racine posed as an Al Jazeera employee to get a password to the network's site, then redirected visitors to a page he created that showed an American flag shaped like a U.S. map and a patriotic motto, court documents said. In June 2003, Racine pleaded guilty to wire fraud and unlawful interception of an electronic communication. As of 2012, the perpetrators of the denial-of-service attacks remain unknown. Another documentary, Al Jazeera, An Arab Voice for Freedom or Demagoguery? The UNC Tour  was filmed two months after 11 September 2001 Terrorist Attack. A further competitor is the Rusiya Al-Yaum channel – the first Russian TV news channel broadcasting in Arabic and headquartered in Moscow, Russia. Rusiya Al-Yaum started broadcasting on 4 May 2007. The Channel is established and operated by RIA Novosti , the same news agency that launched Russia Today TV in December 2005 to deliver a Russian perspective on news to English-speaking audiences, and "Rusiya Al-Yaum" is indeed a translation of "Russia Today" into Arabic. The BBC launched BBC Arabic Television on 11 March 2008, an Arabic-language news channel in North Africa and the Middle East. This is the second time that the BBC has launched an Arabic language TV channel; as mentioned above, the demise of the original BBC World Service Arabic TV channel had at least contributed to the founding of the original Al Jazeera Arabic TV channel. Al Arabiya is a Saudi-owned pan-Arab television news channel broadcast in Modern Standard Arabic. The channel is based in Dubai and is regarded as a competitor to Al Jazeera. Al Jazeera Mubasher Al-‘Amma, is a television channel launched by Al Jazeera Media Network originally on April 15, 2005. It is an all-Arabic channel based in Doha, Qatar that broadcasts conferences and other events live without editing or commentary, using subtitles when translation is needed. The channel is also sometimes referred to as Al Jazeera Live, as Mubasher is an Arabic word for Live and Al-‘Amma is Arabic for General. The channel was formerly called just Al Jazeera Mubasher. The Middle East Broadcasting Center is the first private free-to-air satellite broadcasting company in the Arab World. It was launched in London in 1991 and later moved to its headquarters in Dubai in 2002. MBC Group provides multiple channels of information, interaction and entertainment. MBC Group includes 11 television channels: MBC1, MBC2 and MBC MAX, MBC3, MBC4, MBC Action, MBC Persia, MBC Bollywood, Al Arabiya ; Wanasah and MBC Drama coinciding with the Group’s 20th anniversary, and offers 24/7 Arabic Drama. The Group also includes two radio stations: MBC FM, and Panorama FM ; as well as O3 productions, a specialized documentary production unit. BBC Arabic Television is a television news channel broadcast to the Arab World by the BBC. It was launched on 11 March 2008. It is run by the BBC World Service and funded from the British television licence fee. Aljazeera Publishing was formed in 1992 in London to produce content for expatriate Persian Gulf residents living in the United Kingdom. Aljazeera Publishing was disbanded in April 2011 after the sale of its main assets to regional media organizations including Al Jazeera Media Network, Noor Media and MBC. Al Kass Sports Channels is a group of eight sports channels that are broadcast 24/7 from Qatar. Its official name is Al Dawri wal Kass, which means The League and the Cup in Arabic, since it was initially launched to broadcast domestic football in Qatar. The eight channels of Al-Kass are numbered from one to eight. Starting from 2013, four of its eight channels are encrypted with beIN Channels Network Qatari pay-tv network and these encrypted channels are specified to broadcasting matches of AFC Champions League and AFC Cup. Al Jazeera Media Network(AJMN) is a Middle Eastern multinational multimedia conglomerate, and is the parent company of Al Jazeera and its related networks. The chairman is Sheikh Hamad bin Thamer Al Thani. The acting director general is Dr. Mostefa Souag. The network's news operation currently has a total of 70 bureaux around the world that are shared between the network's channels and operations, the second largest amount of bureaux of any media company in the world after the BBC. Qatar News Agency is a state-run Qatari news agency. Al Mayadeen is a pan-Arabist satellite television channel launched on 11 June 2012 in Beirut, Lebanon. Its programming is predominantly news. It has news reporters in most Arab countries. In the pan-Arab TV news market it competes against Al Jazeera and Al Arabiya, and also against Sky News Arabia and BBC Arabic Television. At its founding in 2012, many of Al Mayadeen's senior staff were formerly correspondents and editors at Al Jazeera. Al Mayadeen is viewed as pro-Hezbollah and pro-Syrian government. Al Jazeera, owned by the government of Qatar, is currently one of the largest news organisations in the world, with 80 bureaus around the globe that produce extensive news coverage online and via TV channels in a number of languages, including Arabic and English. Al Jazeera also produces in-depth documentaries on current issues around the world. 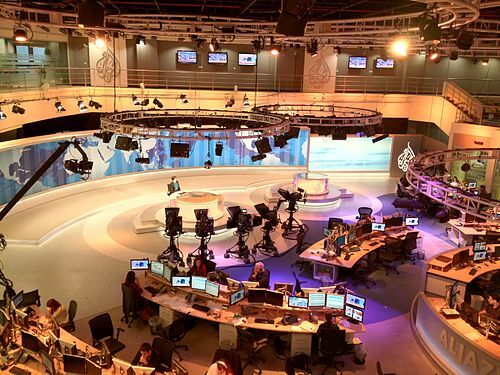 While Al Jazeera has a large audience, the organisation and the original Arabic channel in particular have sometimes been criticised and have been involved in several controversies. Television in Saudi Arabia was introduced in 1964, however, dominated by just five major companies: Dubai TV, Middle East Broadcasting Center,SM Enterprise TV, Lebanese Broadcasting Corporation, Rotana and Saudi TV. Together, they control 80% of the pan-Arabee ENJ broadcasting market. Though private television stations cannot operate from Saudi soil, the country is a major market for pan-Arab satellite and pay-TV. Saudi investors are behind the major networks MBC, which is based in Dubai, and Emirates based OSN. Although satellite dishes have been officially banned since 1990, Saudi Arabia has the second highest satellite TV penetration in the Arab Region, at 97%, and there are 85 free-to-air satellite channels headquartered in Saudi Arabia. beIN Media Group is an independent global sport and entertainment network founded on 1 January 2014, headquartered in Doha, Qatar. beIN distributes entertainment, live sport action, and major international events across 5 continents, in 43 countries, and in 7 different languages spanning Europe, North America, Asia, Australia and the Middle East and North Africa (MENA). The Media of Qatar relays information and data in Qatar by means of television, radio, cinema, newspapers, magazines and the internet. Qatar has established itself as a leading regional figure in mass media over the past decade. Al Jazeera, a global news network which was established in 1996, has become the foundation of the media sector. The country uses media to brand itself and raise its international profile. Egypt–Qatar relations were the bilateral relations between the State of Qatar and the Arab Republic of Egypt. They first began in 1972 and ceased in 2017 due to the Qatar diplomatic crisis. Al-Araby Al-Jadeed is a pan-Arab media outlet headquartered in London. It was first launched in March 2014 as an online news website by Qatari company Fadaat Media. It went on to establish a daily newspaper in September 2014. In January 2015, Fadaat launched Al Araby TV Network as a counterweight to Al Jazeera, which is viewed by some to hold a pro-Muslim Brotherhood bias. Al Araby is a general television network launched in January 2015. It broadcasts a variety of programs and news shows in Arabic, covering society, politics, entertainment and culture. The channel's headquarters are in London and the network has bureaus in several Arab and Western capitals, through 11 bureaus in the Middle East and worldwide. 1 2 Habib Toumi (13 July 2011). "Al Jazeera turning into private media organisation". Gulf News . Retrieved 8 January 2013. 1 2 Shawn Powers. "The Geopolitics of the News: The Case of the Al Jazeera Network" . Retrieved 16 June 2015. ↑ "Arab Gulf States Institute in Washington - Why America Turned Off Al Jazeera - Arab Gulf States Institute in Washington". Arab Gulf States Institute in Washington . Retrieved 6 May 2016. ↑ editor, Patrick Wintour Diplomatic (2017-06-23). "'Close al-Jazeera': Saudi Arabia gives Qatar 13 demands to end blockade". The Guardian. ISSN 0261-3077 . Retrieved 2017-06-23. ↑ CNBC.com, Abid Ali; special to (2017-06-23). "Amid Gulf blockade of Qatar, attempts to muzzle Al-Jazeera are likely to fail" . Retrieved 2017-06-23. ↑ Cockburn, Patrick (12 March 2017). "Saudi Arabia closes local al Jazeera office over Qatar's backing for the Muslim Brotherhood" . Retrieved 23 July 2017. ↑ Ahmed, Akbar Shahid (3 June 2017). "Someone Is Using These Leaked Emails To Embarrass Washington's Most Powerful Ambassador". HuffPost. Archived from the original on 3 June 2017. Retrieved 5 June 2017. ↑ "ANALYSIS: UAE envoy's hacked emails and Qatar's escalating Gulf rift". Al Arabiya. 4 June 2017. Archived from the original on 31 July 2017. Retrieved 5 June 2017. 1 2 "Qatar 1996 coup plot: New details reveal Saudi-UAE backing". Al Jazeera. 17 December 2018. ↑ Arabic CNN (17 December 2018). "قرقاش يكذّب "مرتزقا" فرنسيا ربط الإمارات بمحاولة انقلاب 1996 بقطر". ↑ E.g. in 1999, The New York Times reporter Thomas L. Friedman called Al-Jazeera "the freest, most widely watched TV network in the Arab world". – Friedman, Thomas L. (12 February 1999). "Fathers and Sons". The New York Times : A27. ↑ Matthew Power (June 2006). "Josh Rushing: From USMC to Al Jazeera". Matthew Power: GQ. Archived from the original on 21 September 2012. Retrieved 18 November 2012. ↑ "Al-Jazeera English gets CRTC approval". Canadian Broadcasting Corporation . 26 November 2009. Archived from the original on 3 December 2010. Retrieved 12 April 2012. ↑ Al Jazeera (26 November 2013). "Al Jazeera launches on Freeview HD" . Retrieved 26 November 2013. ↑ "How to watch Al Jazeera English online" . Retrieved 16 June 2015. ↑ Press, Associated (2013-04-29). "Iraq bans al-Jazeera and nine other TV channels over 'sectarian bias'". The Guardian. ISSN 0261-3077 . Retrieved 2017-12-07. ↑ Mohamed Hassan Shaban (10 July 2013). "22 resign from Al-Jazeera Egypt in protest over bias". Asharq Al-Awsat . Archived from the original on 12 July 2013. Retrieved 11 July 2013. ↑ Jessica Chasmar (9 July 2013). "'We aired lies': Al-Jazeera staff quit over biased Egypt coverage". The Washington Times . Retrieved 11 July 2013. ↑ Robert F. Worth (10 July 2013). "Egypt Is Arena for Influence of Arab Rivals". The New York Times . Retrieved 11 July 2013. ↑ Kraft, Dina (2008-07-16). "Prisoner Deal Reopens an Israeli Wound". The New York Times | nytimes.com. Retrieved 2018-11-20. ↑ Toi Staff (2016-02-27). "MK confirms for first time: Israel killed Samir Kuntar". The Times of Israel . Retrieved 2018-11-20. ↑ Articles 15 and 31 in the verdict which was made by the Judge Rafael Yaacobi on 19 February 2014 in case 45542-12-11, Shmuel Rahmani vs Al Jazeera International Limited and Al Jazeera Satellite Network. ↑ Ashraf Mashharawi (2017-08-23). "Israel's Volunteer Soldiers". Al Jazeera. Length 43:02 minutes. Retrieved 2018-11-21. What drives foreign nationals to join the Israeli army, both as paid soldiers and unpaid volunteers? ↑ Netael Bandel (2018-11-18). "Al-Jazeera will pay compensation for a story which compares the IDF to Da'ash". Makor Rishon (in Hebrew). Retrieved 2018-11-21. 1 2 3 Dan Sabbagh (30 September 2012). "Al-Jazeera's political independence questioned amid Qatar intervention". The Guardian . London. Retrieved 3 January 2013. ↑ "Tutu's Children". Al Jazeera. October 17, 2012. Retrieved November 24, 2018. ↑ Grim, Ryan (11 February 2019). "Pro-Israel Lobby Caught on Tape Boasting That Its Money Influences Washington". The Intercept. Retrieved 26 February 2019. ↑ Rosen, Armin (20 January 2017). "Pro-Israel Hoaxer Hits DC". Tablet . Retrieved 26 February 2019. ↑ "Deutsche Welle debuts Arabic channel" . Retrieved 16 June 2015. Wikimedia Commons has media related to Al Jazeera .